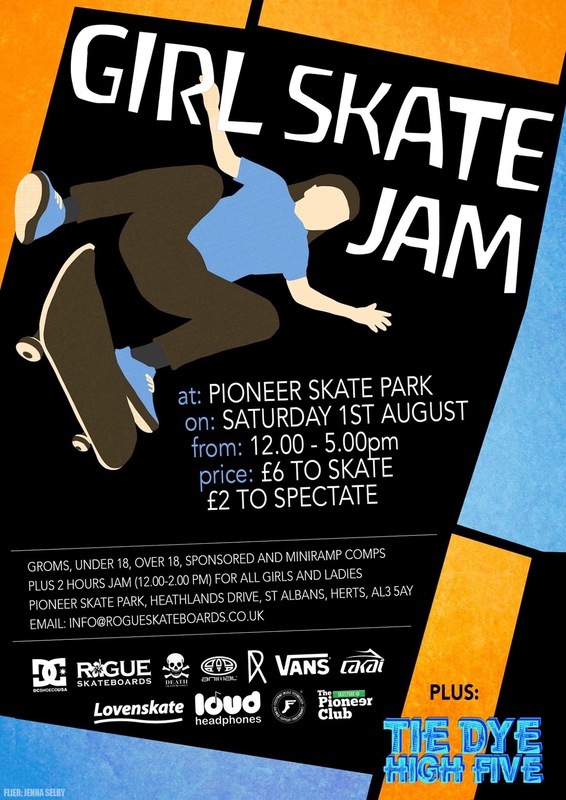 Here is all the info you will need on the upcoming Girl Skate Jam at Pioneer Skate Park in St Albans on Saturday 1st August, now in its FOURTEENTH year with just 2 weeks to go! The day will cost just £6 to skate and £2 to spectate, and all proceeds go to Pioneer Skatepark. The first 2 hours (12-2pm) will be jam format so everyone will get a chance to skate. Next up is the Under 11’s Groms Comp, then Under 18’s, Over 18’s, Miniramp and finally the Sponsored ladies. A best trick comp might get thrown into the mix, time depending. There will be bunch of prizes from a variety of brilliant sponsors up for grabs and you ca even tie dye your own garms with Neon Stash’s Hannah Bailey with her super sought after Tie Dye High Five project! All that plus the usual BBQ and canteen and the day is set to be a winner. There is always a great turnout every year with girls of all ages and abilities, everyone is really friendly so if you’ve never been before head down and go see what all the fuss is about! ← ZOO SKATEPARK GIRLS SESSION TONIGHT!